Tuesday we posted an article about a report by investigators from the UN-sponsored International Commission Against Impunity in Guatemala (CICIG) that found a parallel “security” structure that operated from within several Guatemalan institutions between 2004 and 2008. At least a dozen arrest warrants were issued in August of this year, focusing on extra-judicial executions within the Pavón and Boquerón prisons. The CICIG expected the network to be implicated in at least eight more crimes, including the murders of three Salvadoran PARLACEN diputados. In February 2007, the Salvadoran diputados, who included William Pichinte, Eduardo d´Aubuisson, and Ramón González, and their driver Gerardo Ramírez were diverted from a highway outside of Guatemala City to the isolated La Parga farm. The delegates were tortured, gunned down and their bodies burned inside their vehicle. A few days after the crime scene was discovered, the Guatemalan Police arrested four of their own for the murders. While being held in a maximum-security prison in Guatemala, witnesses described a specialized unit that forced it’s way into the prison and assassinated the detained officers. The CICIG investigation determined that the motive for the assassinations of the three diputados was robbery. William Pichinte, an ARENA diputado, was carrying $5 million dollars and 20 kilos of cocaine in a secret compartment of his vehicle. The parallel ‘security’ structure in Guatemala had identified the delegation, diverted them to La Parga farm, stripped the vehicle until they found the money and cocaine, and then assassinated the diputados and their driver. The four Guatemalan police officers were not the only ones involved in the robbery/murder to be killed. 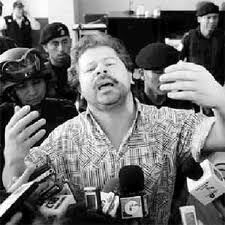 The Venezuelan Victor Rivera, aka “Zacarias,” was one of the principles responsible for organizing the robbery. He arrived at La Parga farm, supposedly to confirm the orders to kill the diputados, and he also intervened during the arrests of the four police officers. Zacarias came to El Salvador in the early 1980’s as a CIA asset to work with former CIA agent Luis Posada Carriles and Lt. Oliver North in the Ilopango Air Base “drug trafficking, kidnapping and training death squads.”(according to former DEA agent Celerino Castillo). He was later run out of the country for ‘creating and operating irregular structures from within the National Civilian Police,’ and was linked to the 1996 police killing of medical student Adriano Vilanova (published by the human rights office in 1996 ). Between 1997 and 2000 ‘Zacarias’ continued working with the private security sector in El Salvador and Guatemala, while picking up several public contracts with the Guatemalan government. He was assassinated in April of 2007. CICIG has implicated drug cartel kingpin Jorge Arturo Paredes Cordova and Rivera’s personal assistant María del Rosario Melgar for his murder. The CICIG report also indicates that Rodrigo Ávila, who was the Chief of the Salvadoran Police at the time of the murders and later a presidential candidate in the 2009 elections, knew that Pichinte was carrying a suitcase full of money, but claims that he thought it was for a real estate deal in Guatemala. Ávila also admitted that Victor Rivera, working as the principle advisor to the Guatemalan Interior Minister Carlos Vielmann, had told him on several occasions that Pichinte was a drug trafficker. Despite these claims, he says he never saw any evidence that Pichinte was involved in drug trafficking, and that the police investigations had turned up nothing. The information in the CICIG report is in direct conflict with the Guatemalan Attorney General’s theory that the 2007 assassinations were motivated by partisan disputes and orchestrated by the Salvadoran ex-diputado Roberto Carlos Silva Pereira and the Guatemalan ex-diputado Manuel de Jesús Castillo. Various Guatemalan and Salvadoran functionaries have re-iterated their support for the Guatemalan Attorney General’s theory pointing the finger at Silva and Castillo. They include former Vice President of Guatemala Eduardo Stein and Salvadoran diputado Roberto d’Aubuisson, the brother of assassinated Eduardo d’Aubuisson. This week, in fact, Guatemala’s public prosecutor Edwin Morroquín has put Silva and Castillo on trial for the murders of the Salvadoran diputados, even though Silva is still in jail in Arizona. With all of the accusations and theories involving the parallel security operation in Guatemala, it’s difficult to imagine that anyone has shared the full truth around these murders. Presenting one theory after another has long been a strategy for ensuring that those guilty of crimes are never punished. In a related example, the investigation of the 1998 assassination of Guatemalan Archbishop Juan Gerardi went on for 9 years, and prosecutors and government officials offered as many as four separate theories as to who was responsible. Finally the government convicted Sergeant Obdulio Villanueva and two others for the murder. Villanueva was decapitated in the Pavón Prison in 2003. While the CICIG’s determination that the diputados were murdered over the $5 million and 20 kilograms of cocaine they were carrying is more than valid, their mandate limits the scope of their investigation to Guatemala, meaning that they have not been able to answer some very important questions. Where did the $5 million and 20 kilograms of cocaine come from? Why did Victor Rivera (aka Zacarias) go to El Salvador and try to meet with Rodrigo Avila the day that the four police were killed in Boquerón? What, if any, Salvadoran names or networks would CICIG investigators have turned up if they could have expanded their investigation across the border? Previous postPacific Rim Files More Lawsuits?? ?